Wdraża najnowszą wiedzę w opiekę nad pacjentami z chorobą przyzębia. Wykonuje specjalistyczne zabiegi z zakresu periodontologii: regeneracji kości, pokrycia recesji dziąsłowych, pogłębienia przedsionka, gingiwektomii/gingiwoplastyki, gingiwoosteoplastyki, plastyki wędzidełek warg i języka, wydłużania koron zębów do protetycznego leczenia, usuwania guzków błon śluzowych, pobierania wycinków do badań histopatologicznych. A graduate of the Medical Academy in Warsaw. 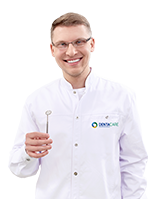 Since she began working professionally she has been associated with the Periodontology Clinic at the Mazowieckie Centre of Dentistry in Warsaw, where she completed her specialty training in October 2013 receiving the title of periodontist. She actively improves her qualifications especially in the field of periodontal and mucocutaneous -gingival surgery. Implements the latest knowledge in the treatment of patients with periodontal disease. Performs specialised treatments in periodontics: bone regeneration, coverage of gingival recession, vestibule deepening, gingivectomy/gingivoplasty, gingival-osteoplasty, plastics of lips and tongue frenulum, crown lengthening for the prosthetic treatment, the removal of mucosal lesions, biopsy for histopathological examination.